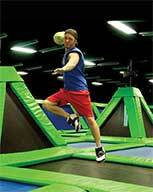 Rebounderz is the latest fun park to the area. Come in to Rebounderz, where family, fun and fitness come together in a whole new way! Enjoy a massive combination jumper with 75 interconnected trampoline beds, a 4-lane foam pit, 4-lane basketball slam, trampoline dodgeball, fitness classes, an enormous indoor playground and toddler park for children 2-12. There is also a Cafe and an adult lounge with free Wi-Fi, arcade games and skill games with redemption toys, basketball courts, and a large corporate events room with the ability to book private jump areas. Looking for a unique and exciting party venue? Come play in one of their six themed, private birthday party rooms with a dedicated party host for 2 hours of fitness filled birthday fun!